At first glance, to make a punching bag with their hands is easy enough to find durable fabric, sew a bag and fill it up. But it's not. For each work stage has its own rules. If there is a need to practice the strokes at home, you can make a punching bag with their hands. First you need to prepare the materials and tools that you need while working. How to choose the fabric and filler? 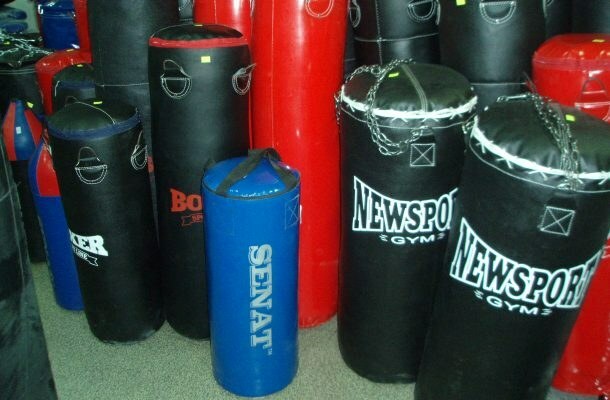 To manufacture a punching bag will need a fairly large piece of thick fabric, as it needs to be folded in several layers. The optimal choice of genuine leather or leatherette. If you can not find this material, you can take the tarpaulin. If you use it, to work out the beats you need to wear gloves, as it is likely to damage the skin. With a pear of leather or imitation leather it is possible to train with his bare hands. As a filler you can use river sand or well-dried sawdust. In the first case, the shell will turn hard, the second easy. However, bag of sawdust can be heavier, using as the inner layer of small rounded stones. Instead of sand you can take a pic. But best of all placeholders is rubber crumb. In addition to these materials you will need steel wire and durable chain. Tools will need scissors, nylon thread, needle, pliers, the tape. Boxing round can be done in the form of a pear or cylinder. In any case, it must have a bottom, so the first thing to do is to determine the diameter and height of the product. Next, the leather or canvas is cut the circle and duplicate this item, as the bottom should be double. Then use the tape measure to measure the circumference, leaving the seam 5-10 cm). This figure will determine the length of fabric. To the desired height of the projectile add 2-3 cm and get the size of the web, which will represent its sides. Then the fabric cut out rectangles the size you want. Enough to have 2-3 layers but you can do more. Parts are placed on one another and perform on the sewing machine stitches at a distance of 1-2 cm from the edges. Further, prostrachivajut the bottom, then sew up the side height of the projectile. Should get the bag in the form of a cylinder of several layers of fabric. Such material is not always possible to stitch on the sewing machine, so part of the work will have to be done manually with a needle, a knitting hook and strong thread. Next, start stuffing the pears to the selected placeholder. It should be enough to top left 15=20 cm free space. Then made a mount by which the projectile is suspended: the top of the cylinder pull the steel wire from which to form a small ring. To him cling durable (preferably climbing) carabiner. In the right place at the premises to the ceiling, attach the chain and hang the finished Boxing round.